At the risk of overloading you all with projects centred around wooden construction I unearthed this short film on British sculptor James Doran-Webb earlier this morning that completely blew me away. The artist who bases himself in the archipelago region of the Philippines transforms discarded inanimate driftwood and other understated materials into life-sized sculptures of animals, with his latest creation reenacting the fierce fight of two male deer stags in a dramatic and captivating scene. Watching this over and doing a little internet research has left me feeling that James hasn’t got anywhere near the recognition for his work. He’s a talent that deserves international recognition of the highest order, so hopefully this film will provide him with the coverage that his skill set so deserves. James has 25 years experience of creating the form of animals and in this time he has extensively learned how best to mimic the silhouette of a range of species, his works are so realistic I’m sure he must be one of the best animal sculptors in the world. 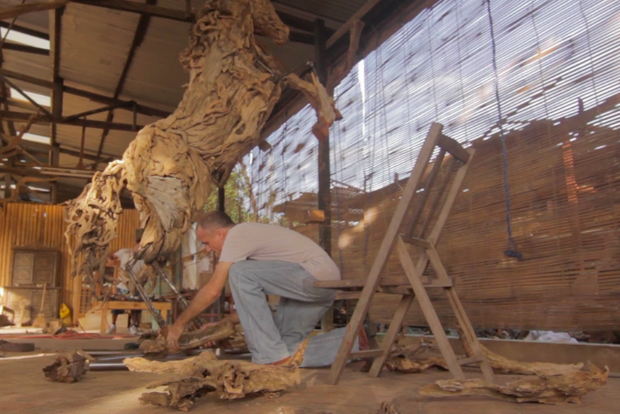 He first began to work with driftwood in particular in 2005 whilst experimenting with the production of furniture, his previous knowledge led him to create a few animals and ever since he has dedicated his time to creating these marvellous masterpieces. Each project he undertakes begins with the welding of a steel frame which forms the foundation of the animal before he carefully selects and cleans the wood with the help of his six trusted assistants that help him realise the finished article. My favourite piece of the film has to be when James goes out into the yard to source the next layer of the stag and explains to us how he begins to select and shape his design. Watching this section you begin to realise the sort of timescales we’re talking to create something like this, especially considering how meticulous he is as a perfectionist, it must take weeks to finish. His passion and dedication to the art is something that is really deserving of being seen by many, so if you enjoy this please share it with your peers. In the meantime, watch below and enjoy.